Our saunas are made from the finest quality timber and built using traditional methods. 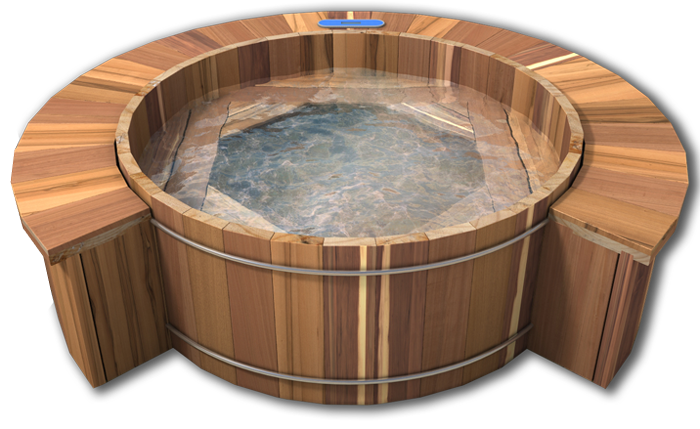 The saunas’ unique design allows it to be placed in the garden or home and as with our wooden hot tubs makes a beautiful addition to either. Having a sauna or tub will make life that little bit more pleasurable every day. Relaxation time is a very important commodity and having a sauna or hot tub will provide you with somewhere to de-stress and unwind day or night. They can also be used as a place to spend quality time with friends and family. Cylindrical in shape, the sauna is 7.5’ in diameter with 7.5’ high walls, which are held together with corrosion proof stainless steel hoops. When sited outdoors the sauna is topped with a cedar shingle roof (total height to roof peak in 10.5’). This roof can be removed if the sauna is placed in the home. The sauna combines; two tiered seating, a sauna stove with volcanic sauna rocks, temperature and timer controls plus a sauna bucket and ladle. As the sauna is assembled on site access is never a problem. Cedar’s renowned stability and longevity will mean our saunas should give you a life time’s service. Want a bit extra added onto your Barrel Sauna? Get in touch and we can discuss your needs. To obtain detailed plan drawings for your Barrel Sauna please give us a call on +44(0)1626 367038 or email us and we will be happy to answer any of your queries and requirements.